One of my youngest memories of my mum was back when we were at our old house, and my mum was getting ready to go out and I was sitting on her bed while she sat at her dressing table putting on her makeup, I must have been about 4 or 5. My mum didn’t wear makeup much, and I just remember thinking she looked so glamourous. She had this blue brush that she used to apply her blusher, and I remember sneaking into her bedroom to rub it on my face every now and then because it was so soft. I then remember as she finished doing her makeup and put on her heels, she looked so different from the usual mumsy way she looked, and I always loved going to look at her shoes, she had some really lovely pairs. I think this must have been the first time I learnt about beauty and fashion from my mum, and I remember as I got older watching her get ready for parties and her talking to me about the makeup she was using, what dress she was going to wear, or how she was going to do her hair. As it was Mother’s Day last week, I’ve been thinking a lot lately about my memories I have with my mum, and how over the years she’s taught me about fashion. Growing up I had some very urm, questionable fashion choices. I remember when I was 11 I was obsessed with these combat trousers with bits of string hanging off them, and I thought I was seriously cool. Then when I was 12 I went through my goth phase, refusing to wear any colour other than black, and lots of studded belts and chains. I even found out that my mum had her own goth phase and still had some of her old studded belts, and even a belt made from bullets which I thought was pretty cool, and I begged her to let me have them but she never let me. For my 13th birthday I had a big disco at the local village hall, and still very much in my goth phase, I managed to convince my mum these black pointy boots with lots of studs and zips on for my party, and I was pretty horrified that my mum bought herself the same pair in red too. Now that I’m much older, and my fashion choices have improved quite significantly, I’ve found my style is very similar to my mums. And in fact in the past I’ve even pinched some of her clothes, and we’ve often given each other clothes when one of us doesn’t want it anymore. It’s not that my fashion style is mumsy, it’s just that my mum is a pretty fashionable lady. She has some amazing clothes, and some of her party dresses are simply amazing. My mums fashionable opinion means quite a lot to me, and whenever I’ve had to buy a dress for an occasion, I always take my mum shopping with me. When we went shopping for my graduation dress she helped me pick out loads of dresses to chose from, and we took over the changing rooms until we found the one. Although me and mum are similar dress sizes and I can get away with pinching her clothes, it’s annoying that we’re not the same shoe size for me to also pinch some of her shoes. In fact next to my mums shoes, mine look like boats, she just has such tiny feet. My mum has some of the cutest heels I’ve ever seen, and I remember when I was around 11 trying to stuff my big feet into this amazing pair of heels she had, and failing miserably. Despite being different sizes, we still have very similar tastes in shoes. 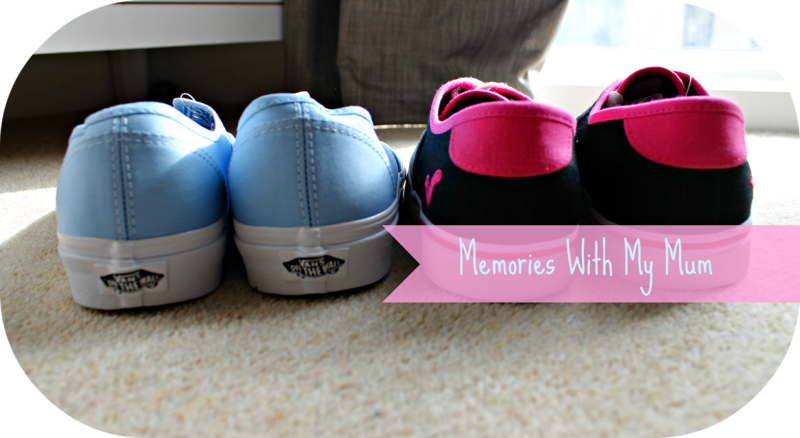 Recently Wynsors Online offered us both a pair of shoes in any style we liked, and without talking to each other about what shoes we wanted, we both picked a very similar pair! Although we both like different colours and patterns at times, it’s nice to see that mine and my mum’s fashion styles are pretty much the same, she’s clearly had a big influence on me! I hope that as I continue to grow up my mum’s still there and influencing me and my fashion choices, especially as I love a good excuse to go on a shopping trip. Do you find that you have a similar style to your mum? Or do you have any style related memories of your mum’s fashion choices from when you were younger?